UPDATE: We’re delighted to announce that SPRINGSTEEN & I has been short-listed for a Screen Award in the category of ‘Online Campaign of the Year’, rubbing shoulders with major releases including THE HOBBIT, IRON MAN 3, STAR TREK INTO DARKNESS and THE WOLVERINE. Watch this space! In November 2012 Ridley Scott Associates announced plans for the production of a music documentary about Bruce Springsteen assembled principally from fan-submitted video. 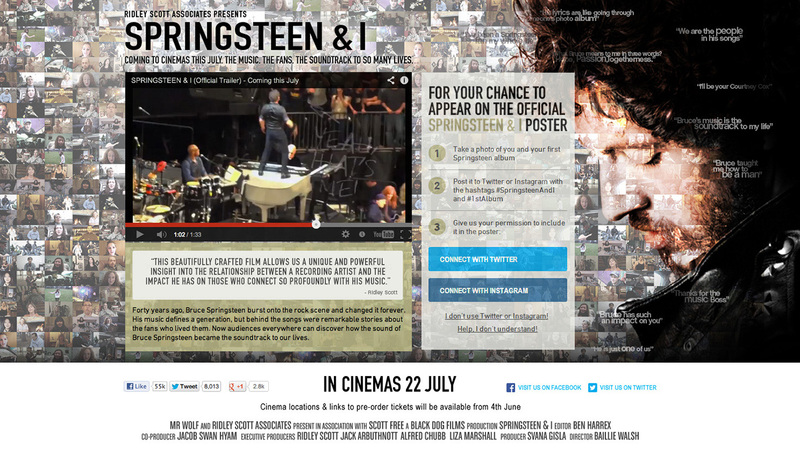 Nine months later, on July 22, 2013, SPRINGSTEEN & I was released on 2,500 screens in over 50 countries. Extending the ‘for-the-fans-by-the-fans’ aspect of the film to the online marketing campaign, we helped mobilise a globally-distributed fan-base in support of the release, gaining traction across vital communities-of-interest and social channels to deliver global reach for a local spend. Throughout the campaign we were responsible for developing and maintaining the official site, key to getting the message out and the money in. It received 490k+ visits from 320k+ uniques across the 12 weeks of the campaign, driving 155k referrals to local exhibitors through the site’s continuously updated ticket booking facility: a 32% conversion rate. 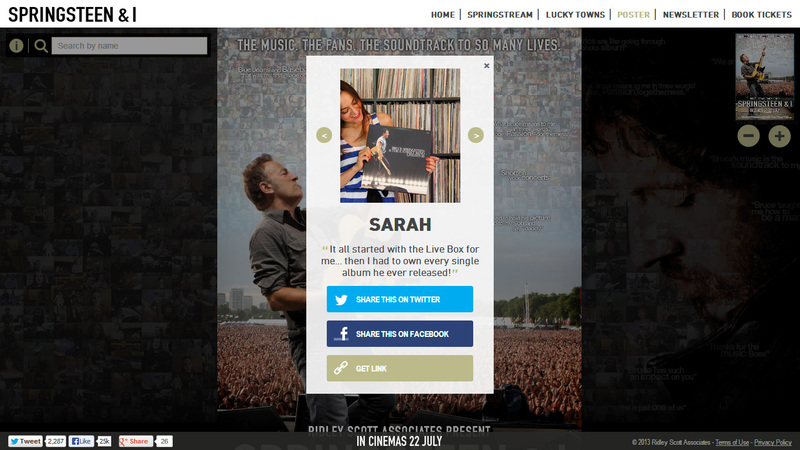 As part of the launch announcement we invited Springsteen fans to post pictures of themselves with their #1stAlbum to Twitter or Instagram, for the chance to appear on the film’s official poster. Over 350 fans were featured on the final artwork, and were able to find themselves on an interactive version that saw 60k+ visits across the campaign, with an avg. time-on-page of over 2 minutes. 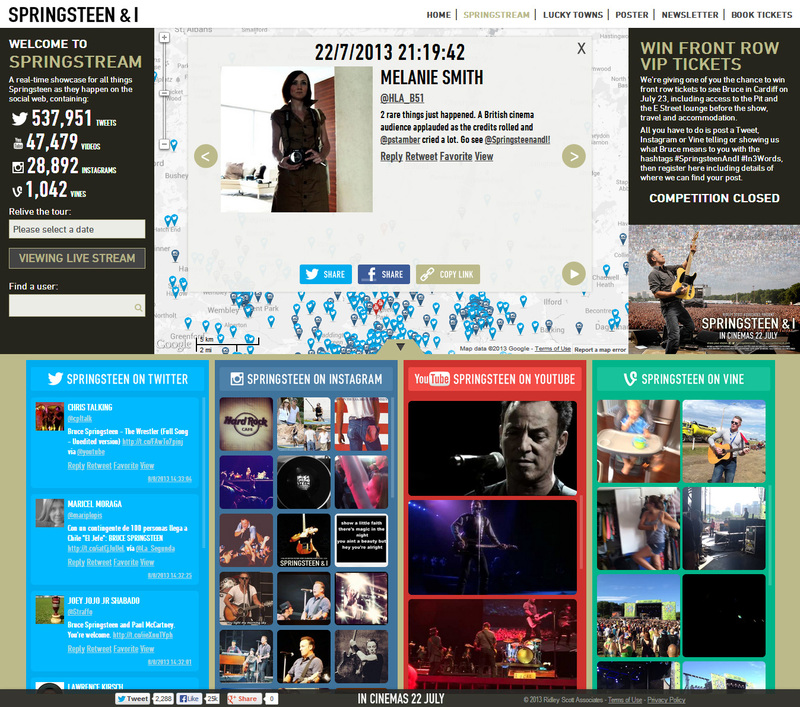 A real-time visualisation of all things Springsteen as they were happening on the social web, ‘Springstream’ aggregated 600k+ mentions from Twitter, Instagram, YouTube and Vine, including a ‘Relive the Tour’ feature allowing you to play back gigs from his European tour through the eyes – and emotions – of the arena audience. 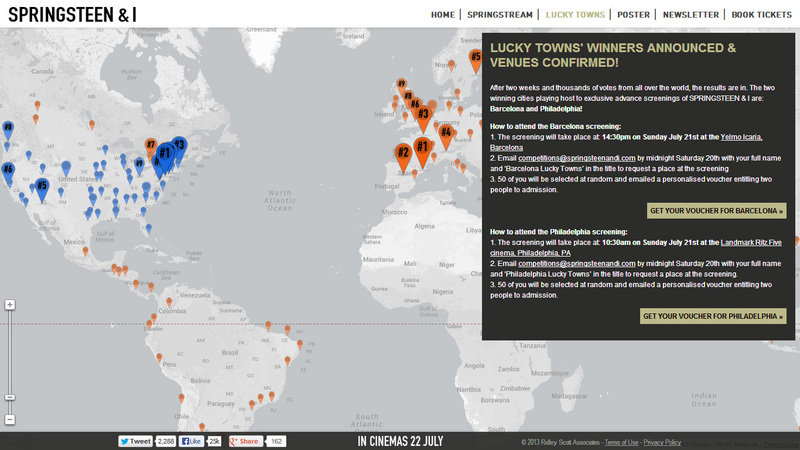 Closer to release we announced the opportunity for two cities around the world to host exclusive advance screenings of the film, with fans able to vote on Twitter or Facebook using the #LuckyTowns hashtag. Thousands of votes from over one hundred cities later, Philadelphia and Barcelona were declared the winners, announced in one of several bespoke mailshots we sent out over the course of the campaign. As well as these major campaign beats we worked on a number of smaller initiatives conceived to maximise awareness and appointments-to-view across the widest possible audience. The infographic below, conceived, crafted and seeded on the day of release, makes reference to a number of these, and seems like a good way to sign off in terms of showcasing a campaign that was as agile as it was ambitious, and gave us a precious insight, we believe, into the theatrical marketing and distribution models of the future.